All weekend I was thinking about doing some kind of witch theme on my nails, but come Sunday evening I flip-flopped into designing a black widow spider and webs. The spider is hand painted – first I made two dots to form the body and head, then used a fine paintbrush to do the legs and the distinctive red mark. The web design is from my stamping Cheeky Jumbo Plate A – it was initially a pattern I didn’t think I would use, but it is actually one that I gravitate towards the most and it was perfect to give the spider web vibe. 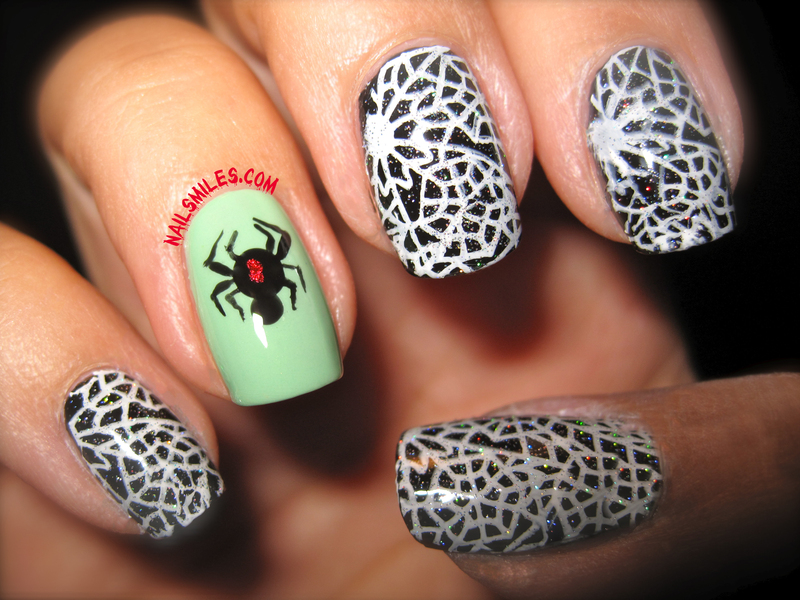 I think a cute alternative to doing webs on each nail would be to do black and white stripes; still very Halloweeny. This was my first time using a mint Nailite polish that I got on clearance for a whopping 42 cents (directly from their website). It took two coats to be opaque, and although it seemed a little streaky when applying, the color became even after drying. The brush is pretty thin so you can’t cover your whole nail in one swipe, but nonetheless it turned out well. Now all I need is a Spider WOman costume :).